warning: this is a non-makeup/non-abubot related post. for days now, i feel like i have a flu. my muscles feel sore, my eyes feel sore and i feel so effin' bloated when in fact, i haven't been eating well for days now. i am feeling too lazy to move...to come to work...even smile. all i want to do is to lie down, not sleep...but just lie down and do nothing. i try to stay calm, composed and stop myself from crying each time i talk to you. i try to act as if i'm okay, when in fact, i am not. i came to work early tonight...you left to have dinner with some friends. i told you i can't join you because i am having a meeting, but the truth is, i just dont want to go and spend time with you. weird, huh!? i dunno, maybe i want to get used to not being with you anymore. 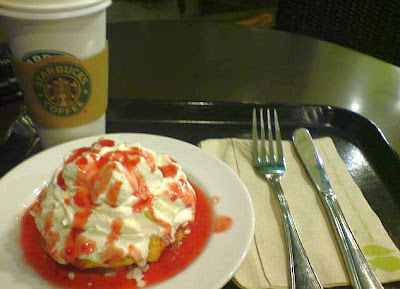 then i remembered...i used to have midnight snacks like this with you. you'd visit me during my break and treat me to coffee and waffles. sometimes, you'd take me to yellow cab and make fun of me while i munch my pizza like there's no tomorrow. 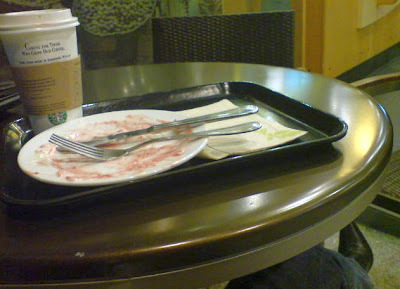 now, i am eating alone...and will be eating alone for the days to come. i miss those late night snacking...those nasty comments you'd shoot at me when i overeat and then complain bout my weight afterwards...and i'd surely miss the flowers you bring me as a surprise for just-because occasions...and most of all, i will miss being with you. i'm gonna miss you, mahal...can you just not leave? don't worry.. everything you are sacrificing will all be worth in the end. well that made me tear up. you're gonna be alright Jheng. He'll be gone and back sooner than you think. At least in this day and age, you don't have to hold on and wait for just letters on the mail anymore. Be well and stay safe. Wahhhh That made me cry also... Hirap noh? I was that emotional when he went away and i was forever waiting for him to be online just to talk with him. Its hard and painful but you'll get used to it. :) We are here for you hehehehehe basta libre make-up hahahaha just kidding :) Anyway we can now look at boys as many as we want! hehehe just look lang ah! mwah! awww.. sis, be strong!.. i hope and pray that you'll get through this..
awww. honey... this is all too heartfelt. it is hard. but take comfort in the fact that he's just a buzz, a call, a text away. and in time, it will be better. hang in there okay? meanwhile.. we're just here for you. how long is he staying there? Sis, it will be okay. i know how difficult it is to part from a loved one because the opportunities are somewhere else. be strong. we are here for you. thanks mga sis...i am really trying to be strong and hold back the tears para nde sya mahirapan umalis, but i can't. each time i'd try to open my mouth to talk to him naiiyak na ako. i really dont want him to go. we've been together for almost 15yrs and lagi kami magkasama halos everyday for 8 yrs...ngaun lang kami magkakahiwalay ng ganito katagal. i can't imagine living my life without him. pagkagising ko siya agad nakikita ko...ngayon ako na lang mag-isa. Ohh Jheng, I'm so sorry. It's really hard, it gets better a bit.. but still hard. the last time I went home to see my dad, I cried so much. And I thought I was used to it already, it's really painful being far from a loved one. At times like this, it makes me hate a lot of things about philippines and the governemnt now and then. There's no perfect government, but ours have too much greed and lack of conscience. Imagine half a century ago, our country was rich while S. Korea was a third world country.. In a matter of decades they made themselves powerful and rich, while our country plunged into poverty. But you know what, it's better now to stay in touch with all our technology. I used to wait for a snail mails every single day, I'd be so heartbroken not seeing a mail for me. Long distance calls used to be very expensive too, it was really tough growing up like that. Now, we stay in touch through web cam. We eat dinner here, and they're eating breakfast in that side of the world. Kinda helps..